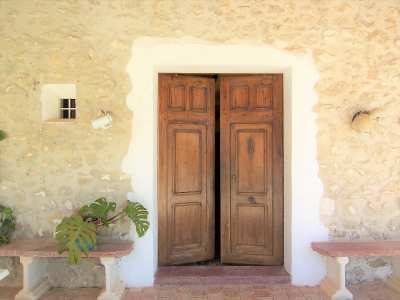 For Sale: Steeped in history this property enjoys a real countryside feel with stunning country and mountain views with the quaint village of Jesus Pobre a short distance away. The finca is distributed primarily over 2 levels. Entering through the bourganvilia framed naya you come across the property´s name sake, the magnificent carob tree. This naya provides a cool place to enjoy the views and from here you can enter the property via the kitchen, which was refurbished 5 years ago and is fully fitted with integrated appliances. The living room enjoys the fireplace as the main focal point with double aspect views. 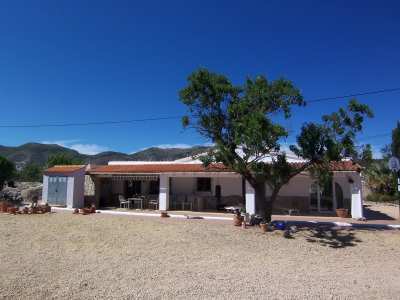 Unusually this finca, benefits from large windows letting maximum light in. A few steps lead to the office and also out onto the Andulacian style courtyard. The bedroom on this floor is currently being used as a dining room. On the upper level is the 2nd guest bedroom and generous master with en-suite bathroom. In addition there is a family bathroom and utility room. From the master and guest bedroom there is access out onto the west facing naya.There are various shady and sunny spots to enjoy the area around the pool including a covered terrace with built in bbq grill. Flower beds frame the pool abundant with roses and other such colourful flowers. There is land on all sides of the property, terraces planted with lavender and olive trees to the north/east side and 2 long, flat levels to the south side and flat land to the north side. The villa boasts a large freeform pool with absolute privacy and views from all aspects. Must be seen to appreciate the views and surroundings.